The Abrahamic faiths have a long tradition of peaceful and respectful trading activities between them. Each have their own rules and guidelines for fair methods of trading – both with people of their own faith, those of other faiths and those of no faith at all. Justice, compassion and a focus on honest work and enterprise are key components. Did you know, for example, that the Qu’ran has more written on the subject of trade and commerce, than any other subject? 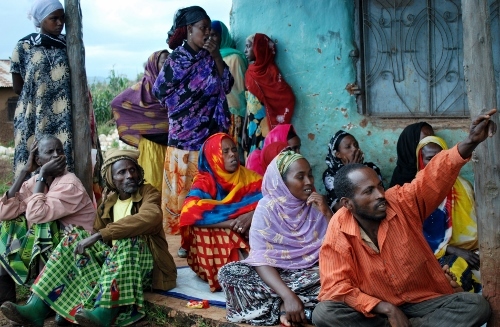 The largest portion of the world’s poor is the 800 million who live in rural areas. great distances from the nearest markets and basic social services. The majority of these people are ‘subsistence’ producers or farmers; barely able to make a living beyond feeding their families enough to stay alive. Making enough money to be able to sell a crop, to be able to cultivate it and to sell it for a fair price so that they can access better health, education and housing is simply a dream for most of them. Empowering these communities to be able to take control of their own destiny is the aim of the Lorna Young Foundation (LYF). Download our Farmer Radio Leaflet here. Muslim supporters and volunteers of the LYF are keen to spread the word about this small but mighty UK based charity. Unlike many of the other ‘household name’ charities, the LYF focuses entirely on helping poor communities both in the UK and overseas, to empower themselves by becoming effective, ethical entrepreneurs – whether this be in farming or other forums of business. Not content with providing ‘a hand-up, rather than a hand-out’ however, the LYF also uses its programmes to bring together different communities and people of faith. 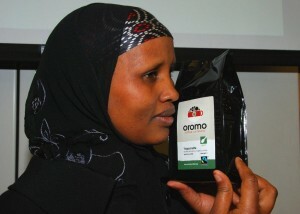 Several years ago the charity set up the ground-breaking Oromo Coffee Company – a Fairtrade coffee company which the LYF initiated to support Oromo refugees in Greater Manchester thereby promoting a working relationship between Muslim and Christian Oromo refugees, and with local people who are often exposed to extremist political views. Then the charity set up ‘Not Just A Trading Company’ across the north of England – helping young Pakistani, white and Afro-Carribean youth from deprived areas to work together to form their own ethical trading enterprise in partnership with supporting the products that come from developing countries. The LYF has also worked to support Arab producers in Palestine/Israel and continues to develop new approaches to bring communities together in the name of ethical trade. Christina Longden, Director for the LYF has also been a key driving force for our work to help poor Muslim communities both overseas and in the UK. You can find out more about Chris’ own personal passions to challenge negative perceptions of Muslims here. The LYF is a very unusual, small charity. Based in Huddersfield, UK, the organisation has minimal overheads. No expensive offices or salaries and no feathering our own nests. We work to keep the vast majority of our funding with the people who need it the most and who can only dream of the privileges that we have. PLEASE consider donating zakat to The Lorna Young Foundation this year. You can download our Farmer Radio Appeal Leaflet here. This entry was written by Ian Agnew, posted on 16/06/2017 at 12:16 pm, filed under Uncategorized and tagged Africa, charity, Ethiopia, giving, Islam, Lorna Young Foundation, muslim charity, Oromo, Ramadan, zakat. Bookmark the permalink. Follow any comments here with the RSS feed for this post. Post a comment or leave a trackback: Trackback URL.